The day that I have both been fearing and excitedly anticipating finally arrived. Today I began potty training Connor. I decided to take a cold turkey approach. We are chilling at home over the next few days and Connor doesn't get a diaper or pull-ups. Just some big boy undies. Today we changed those undies six times. Six times! But tomorrow will be better. After thinking about how to reward Connor for using the potty, I decided on something right up his alley. 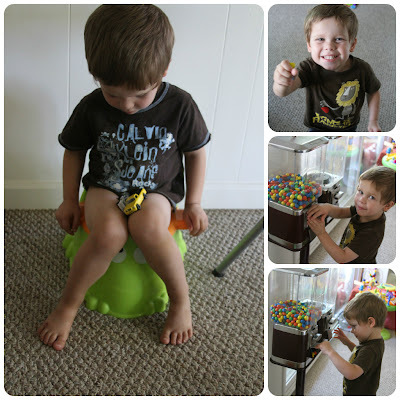 Every time he goes potty in the toilet, he gets a quarter for the candy machine. Yes, we have a candy machine in our house. Thankfully it only dispenses 2-3 m&ms per quarter, so we are good there. Our plan is also to go to the store and pick out an amazing present for Connor that we will put on display and once he goes a week without accidents (nights not included) he gets said amazing present. Oh, and I have decided I won't start night training until Connor has mastered the days. But my plan is to go cold turkey on that as well. I have heard once they wet the bed a couple times, they tend to learn really fast. I'm all in on this one. Here's to hoping Connor is a quick learner!